There are these Tag badges as we all know. How can we track progress towards these tag badges? For all other regular badges i can track the progress from my profile as seen below. 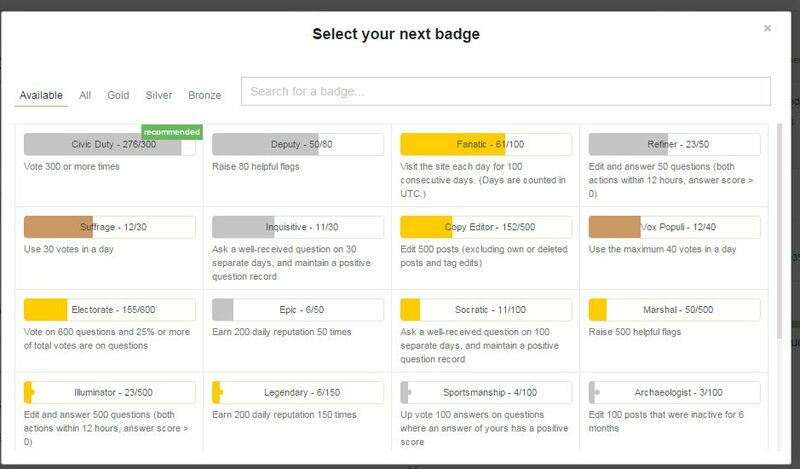 is there a similar place to check progress towards tag badges? Tag badges are tracked separately from other badges. You'll find the tracker for this in your "Reputation" box, to the left of where the badge tracker is. The gear will be next to the "Next Privilege" tracker. The tracker will automatically select the tag badge you're closest too, but you can click the gear next to the tag badge to select which tag badge you'd like to track. Not the answer you're looking for? Browse other questions tagged support badges profile-page . Do the colors of the progress bars on the profile page mean anything? Is there a way to see current progress towards a badge? How do I track tag badge progress for a given tag? How many gold badges are there?